I recently came across the idea of a savoury blue cheese cheesecake in an issue of Food & Drink magazine and I was immediately taken by the idea! I am a huge fan of cheesecake and I had never even thought about trying a savoury cheesecake let alone one made with a blue cheese! It sounded so amazingly good that I had to try it. As soon as I saw the blue cheese cheesecake I knew right away that I would be trying it with gorgonzola which is my favourite blue cheese. This recipe is really simple and I had my cheesecake in the oven in almost no time at all. Shortly after I got the cheesecake in the oven my apartment filled up with the amazing aroma of baking gorgonzola! By the time that I pulled it out of the oven I could barely restrain myself from digging in right away and at least letting it cool a bit. Tangy gorgonzola goes really well with the sweetness of pears and I could not resist using this classic flavour combination by topping the cheesecake with a vanilla pear compote in a thick fruity syrup. I served the gorgonzola cheesecake on a bed of peppery arugula and garnished everything with some chopped toasted walnuts and jewel like crimson pomegranate. The savoury gorgonzola cheesecake was fantastic! It was just packed with flavour and the sweet an juicy pear compote was the perfect foil to balance things out. If only I had discovered savoury cheesecakes earlier! Now it is time to experiment with them some more! Note: The recipe for this savoury cheesecake perfectly portioned for two as a light meal when made in a pair of four inch spring form pans. You could also make this recipe as more of an appetizer if you used a muffin pan. Beat in the eggs, one at a time until smooth. Mix in the sour cream and gorgonzola. Pour the mixture into 2 4 inch springform pans (or 8 holes in a muffin pan). Bake in a preheated 350F/180C oven until set, about 20-30 minutes minutes. Place enerything in a small sauce pan, bring to a boil, reduce the heat and simmer until the pears are tender, about 5 minutes. Remove the pears and set aside. Increase the temperature and simmer to reduce to a syrupy texture. Mix the pears back into the syrup. That looks stunning and yummy Kevin. I've been reading about savory cheesecakes and it is on my itinerary. I like the pairing of the pear compote – woondering if the vanilla addded a sweet component. Perfect with the peppery arugula. been dying to do a savory cheesecake for a while. glad you did it first. if you were going to make a crust would you use crackers or a mild shortbread or even grahams? i would love a crust, for the texture feel. I've always loved the pairing of gorgonzola and pears. I've never tried a savory cheesecake but would love to after seeing this. cool, Kevin! love the savory cheesecake idea. Kevin i am obsessed with the food you make! That cheesecake is just lovely! A fabulous recipe! Savory cheesecakes are delicious. 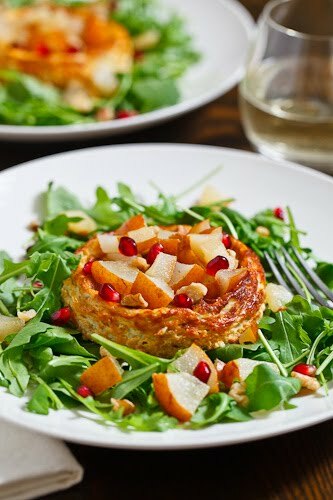 Love pears with savory things and have made a pear and goat's cheese tart in the past, but this looks like a lovely treat and I'll have to try it (though I'm thinking of replacing the sour cream with greek yogurt). I've never thought to do individual cheesecakes as a meal! This sounds amazing! That looks so stunning and delicious! I've been all over salads lately, and this one with ooey gooey cheese hits the mark. Love it! This reminds me of a blue cheese souffle. I love your accompaniments, too – how creative! Indulgent, savoury, hunger inducing. There isn't enough ways to describe how perfect this looks and tastes. Well done, the pear is perfect. A friend of mine's mom runs a cooking school, one of my favorite recipe's of hers is a smoked salmon herbed cheesecake. I am moderately obsessed with all blue cheese, and I also saw the recipe… but I didn't get around to it, or thought a cheesecake would be too tough. Thank you for sharing your experience. Perhaps I will muster up the courage to try it, because it does look so amazingly delicious. 1. WOW. That looks amazing. And I really mean it. 2. Brilliant idea for a recipe too! Looks great! I have often thought about a savoury cheesecake but never with Blue Cheese. Usually I am thinking goat cheese. I'll have to try this one out.